Vancouver, British Columbia — April 10, 2019 — Triumph Gold Corp. (“Triumph Gold” or the “Company”) (TSX Venture Exchange: TIG) is pleased to announce its intention to complete a non-brokered private placement (the “Offering”) of up to 17,000,000 units (the “Units”) at a price of CDN$0.35 per Unit for gross proceeds of up to CDN$5,950,000. Each Unit will consist of one common share in the capital of the Company (a “Share”) and one-half of one common share purchase warrant (each whole common share purchase warrant, a “Warrant”). Each whole Warrant will be exercisable to acquire one Share at an exercise price of CDN$0.60 per Share for a period of 24 months from the date of issuance. This news release does not constitute an offer to sell or a solicitation of an offer to buy any of the securities in the United States. The securities have not been and will not be registered under the United States Securities Act of 1933, as amended (the “U.S. Securities Act“), or any state securities laws and may not be offered or sold within the United States or to U.S. Persons unless registered under the U.S. Securities Act and applicable state securities laws or an exemption from such registration is available. Certain information contained in this news release constitutes “forward-looking information” or “forward-looking statements” (collectively, “forward- looking information”). Without limiting the foregoing, such forward-looking information includes statements regarding the process and completion of the Offering, the use of proceeds of the Offering and any statements regarding the Company’s business plans, expectations and objectives. In this news release, words such as “may”, “would”, “could”, “will”, “likely”, “believe”, “expect”, “anticipate”, “intend”, “plan”, “estimate” and similar words and the negative form thereof are used to identify forward-looking information. Forward looking information should not be read as guarantees of future performance or results, and will not necessarily be accurate indications of whether, or the times at or by which, such future performance will be achieved. Forward-looking information is based on information available at the time and/or the Company management’s good faith belief with respect to future events and is subject to known or unknown risks, uncertainties, assumptions and other unpredictable factors, many of which are beyond the Company’s control. For additional information with respect to these and other factors and assumptions underlying the forward-looking information made in this news release, see the Company’s most recent Management’s Discussion and Analysis and financial statements and other documents filed by the Company with the Canadian securities commissions and the discussion of risk factors set out therein. Such documents are available at www.sedar.com under the Company’s profile and on the Company’s website, www.triumphgoldcorp.com. The forward-looking information set forth herein reflects the Company’s expectations as at the date of this news release and is subject to change after such date. The Company disclaims any intention or obligation to update or revise any forward-looking information, whether as a result of new information, future events or otherwise, other than as required by law. Vancouver, British Columbia: April 9, 2019. Triumph Gold Corp., (TSX-V: TIG) (OTCMKTS: TIGCF) (“Triumph Gold” or the “Company”) is pleased to announce that the Yukon Government and the Little Salmon Carmacks First Nation have reached an agreement for the proposed Carmacks bypass. The bypass will significantly reduce traffic flow through the community and will help ensure the safety of Carmacks residents by redirecting industrial traffic away from the community. Vancouver, British Columbia: September 20, 2018. Triumph Gold Corp., (TSX-V: TIG) (OTCMKTS: TIGCF) (“Triumph Gold” or the “Company”) is pleased to announce the September 15th start of a geophysical program on its road accessible, 100% owned, Freegold Mountain property. The geophysical program encompasses the entire length of a multi-element soil anomaly that surrounds the Blue Sky, Revenue and Nucleus areas (Figure 1). The program is being conducted by SJ Geophysics and will include resistivity (DC), induced polarization (IP), magnetotelluric (MT), and ground magnetic surveys. The configuration of the IP survey is designed to provide data to a depth of 700 metres and the MT survey extends the depth of investigation to approximately 1,200 metres. The DC, IP and MT surveys will cover approximately 30 line-kilometres, with three 7 km long lines running the length of the soil anomaly from NW to SE, and three approximately 3 km long lines running across the Blue Sky Zone in a N-S orientation (Figure 1). The survey is expected to be complete by October 5 and will require several weeks for further data processing before final results will be delivered to the company. Follow Hyperlink to Figure 1. Age dating by the Mineral Deposit Research Unit (UBC), Yukon Geological Survey and other researchers has demonstrated that the newly discovered high-grade, gold-rich mineralization in the Blue Sky Zone (e.g. 316 m of 1.79 g/t AuEq* in RVD18-19, PR18-09) and WAu breccia (e.g. 128m of 1.27 g/t AuEq* in RVD18-08, PR18-07), as well as epithermal gold mineralization in the Nucleus area, are at least 30 million years younger than their host rocks. Therefore, the intrusive bodies, which are the cause of the mineralization, have yet to be discovered. The geophysical surveys are designed to test for an underlying intrusion that was a driver for the widespread and intense hydrothermal systems responsible for the near-surface mineralization. The surveys extend across, and up to 500 metres beyond, the full length of the six kilometre soil anomaly that encompasses the Blue Sky Porphyry, WAu breccia, Revenue, Nucleus, and numerous other showings. The length of the survey lines (7 km), and the dipole spacing (200 or 300 m), are optimized to test beneath the known, at- or near-surface zones of mineralization, to relate them to an underlying and potentially well mineralized source. Multiple drill intersections of mineralization within the Revenue diatreme (main breccia body), including 44.00 metres of 1.08 g/t AuEq* (from 198.00m in RVD18-02), 19.81m of 1.24 g/t AuEq* (from 91.44m in RVD18-10), and 11.00 metres of 2.04 g/t AuEq* (from 146m in RVD18-10) (Table 2). Modelling of the breccia as an east-west striking, south dipping body helped successfully target five additional drill holes in 2018 to test the breccia east of, and both up and down dip from, the original RVD11-19 drill intersection. These drill holes confirmed the continuity and grade of the breccia over a 130 metre strike length, and to a depth of at least 200 metres (Table 1). The breccia is open to depth and to the west beneath the Revenue diatreme. Drill hole locations are shown on Figure 1, and details of location and orientation are in Table 3. Additional drilling in 2018 targeted breccia hosted mineralization within the Revenue diatreme as well as adjacent porphyry style mineralization at Revenue East, and the porphyry style Keirsten Zone, which was identified in 2017 (PR#17-13, November 2, 2017). Porphyry style mineralization has also been identified in a number of locations beyond Revenue East (e.g. to the east in the Blue Sky Zone, and to the west at Revenue West and in the Guder Zone). The Blue Sky Zone, and Guder Zone are being tested during the current drill campaign, and results will be reported separately. Within the eastern part of the Revenue diatreme, a series of shallow holes were drilled to test for near surface oxide gold, as intersected in RVD17-10 (0.64 g/t Au over 68m from 36m; PR#17-12, October 19, 2017). Although the oxide gold encountered in 2018 was lower grade than that intersected in 2017 (e.g. RVD18-09 with 28.96m @ 0.342 g/t Au), significant higher-grade gold and copper was intersected in an underlying and previously unknown supergene blanket (e.g. RVD18-10 with 19.81m @ 0.887 g/t Au, 2.7 g/t Ag, and 0.16% Cu) that consists of chalcocite on fractures and coating pyrite, and which has also been identified elsewhere at Revenue East, e.g. in the upper portion of the WAu breccia. Sulfide replacement and hydrothermal breccia mineralization was intersected as well (e.g. RVD18-02 with 44m @ 0.405 g/t Au, 1.9 g/t Ag, and 0.09% Cu, and RVD18-10 with 11m @ 1.563 g/t Au, 6.66 g/t Ag, and 0.22% Cu) (Table 2). Porphyry style mineralization was identified at Revenue East in numerous historic drill holes (e.g. RVD11-22 with 238.10m @ 0.13% Cu, 0.31 g/t Au, and RVD11-028 with 104.15m @ 0.17% Cu, 0.32 g/t Au and 0.09% Mo). The footprint of porphyry style mineralization at Revenue East was extended westwards by 110 metres with RVD18-02 and south 40 metres by RVD18-01. It was also identified on the northeast edge of the Revenue diatreme with RVD18-07, greater than 200 metres north of the main body of porphyry mineralization. The Keirsten Zone is a blind target, located under tens of metres of overburden between the Revenue and Nucleus deposits. Inaugural drilling of the zone in 2017 tested the core of a strong chargeability high and encountered intense, multi-stage porphyry style alteration and veining in a granodiorite porphyry host rock from 193 metres to the end of the hole at 603.50 metres. The 2018 drill campaign expanded the zone of strong porphyry-style alteration and veining, but copper and gold mineralization, although widespread, is generally low grade (Table 2). An 18,000 metre diamond drill program is currently in progress on Triumph Gold’s 100% owned, road accessible, Freegold Mountain property. Exploration is mainly focused on identifying new porphyry and epithermal mineralization within a 6 km long soil and geophysical anomaly that envelops the Revenue and Nucleus deposit areas (Figure 1). Results in this news release represent less than 30% of the total planned program. Drilling is now complete in three additional areas, the Blue Sky Zone (e.g. RVD17-13 with 1.01 g/t Au and 0.285% Cu over 57 metres), the Guder Zone (e.g. RVD17-14 with 15.0 g/t Au over 7 metres), and the Granger Zone (e.g. GRRAB-091 with 4.48 g/t Au over 16.73m). The results from drilling in these zones will be released as they are received and checked for quality. Two drills are currently situated over the Nucleus deposit area where they will drill approximately 4,000 metres. When the drilling at Nucleus is complete one drill will be mobilized to conduct the inaugural drill test of the Irene epithermal vein prior to the end of the field season. Drill core samples ranged between 1.00 and 2.00 metres length and were cut at Triumph’s core logging facility on the Freegold Mountain Property. The samples were analyzed by SGS Canada of Vancouver, British Columbia. They were prepared for analysis according to SGS method PRP89: each sample was crushed to 75% passing 2mm and a 250g split was pulverized to better than 85% passing 75 micron mesh. Gold was tested by fire assay with atomic absorption finish on a 30g nominal sample (method GE FAA313), and samples that tested over 10 g/t Au were retested using 50g screened metallics (GO FAS50M), which uses a combination of AAS, ICP-AES and gravimetric finishes to determine gold contained in both a fine and coarse fraction after being sieved through 106 mesh. An additional 35 elements were tested by ICP-AES using a four-acid digestion (method GE ICP40B), over limit samples for copper were retested using the same technique but with assay grade four acid digestion and a higher range of detection (method GA AAS42S). Quality assurance and control (QAQC) is maintained at the lab through rigorous use of internal standards, blanks and duplicates. An additional QAQC program was administered by Triumph Gold: at minimum three quality control samples, consisting of blanks, certified reference standards and duplicates, are blindly inserted into each 75 sample batch. QAQC samples that return unacceptable values trigger investigations into the results and reanalyses of the samples that were tested in the batch with the failed QAQC sample. Vancouver, British Columbia: July 20, 2018. Triumph Gold Corp. (TSX-V: TIG) (“Triumph” or the “Company”) is pleased to announce that pursuant to its stock option plan, the Company is issuing 800,000 options to officers and directors. The options are priced at $0.40 and are valid for a period of 5 years. The stock options will vest 25% immediately, 25% after six months, 25% after twelve months and 25% after eighteen months. Discovery of two new gold-silver-copper occurrences, the Julep and the Gentleman vein (Figure 1, Table 1). Alteration mapping, aided by the collection and analysis of 67 near-infrared reflectance (TerraSpec) samples, verified that the property has been affected by intense phyllic to advanced argillic alteration over an approximately 2 X 2 kilometre area, constituting one of the largest and most intense alteration zones in northern British Columbia. The Andalusite Peak property was acquired by staking in January 2017. It is located in northwestern British Columbia 65 km north of the Red Chris Cu-Au mine, 20 km west of BC highway 37, and 7 km south of the Kutcho Creek mining road. The property covers an alteration “blow-out” in the center of a 27-kilometer-long belt of strongly altered rock that was identified and mapped in 2016 by BC Geological Survey geologist Bram van Straaten. Two similar alteration blowouts are known along the belt and both represent important exploration properties: 1) the Tanzilla property, 11 km to the northwest of Andalusite Peak, is owned by Kaizen Discovery and was optioned to Freeport McMoRan between 2013 and 2015, and 2) Teck Resources’ McBride property is 12 km to the southeast of Andalusite Peak. On these properties, porphyry-style mineralization has been identified within and beneath the alteration lithocap. Only one historical record of exploration on the Andalusite Peak property exists (BC assessment report 30590); in the report, the intensity of the alteration was noted and the discovery of an outcrop containing massive coarse andalusite was documented. The presence of andalusite on the property indicates that it has experienced higher temperature and more intense alteration than any other location along the 27 km belt. * Grab samples are selective in nature and the resulting assays may not be representative. Sample were delivered directly to the ALS Global prep-lab in Whitehorse, YT, and analyzed by ALS Global in North Vancouver, British Columbia. They were prepared for analysis according to ALS method PREP35: each sample was crushed to 70% passing 2mm and a 250g split was pulverized to better than 95% passing 106 micron mesh. Gold was tested by fire assay with atomic absorption finish on a 30g nominal sample (method Au-AA23). An additional 35 elements were tested by ICP-AES using an Aqua Regia digestion (method ME-ICP41), over limit samples for copper were retested using the same technique but with assay grade Aqua Regia digestion and a higher range of detection (method ME-OG46). Quality assurance and control (QAQC) is maintained at the lab through rigorous use of internal standards, blanks and duplicates. Vancouver, British Columbia: January 19, 2018. Triumph Gold Corp., (TSX-V: TIG) (OTCMKTS: TIGCF) (“Triumph Gold” or the “Company”) is pleased to announce that it will be exhibiting at the AME BC Roundup Core Shack on Wednesday, January 24 and Thursday, January 25. The conference is being held at the Vancouver Trade and Convention Centre West, 1055 Canada Place, Vancouver, BC. Vancouver, British Columbia: December 11, 2017. Triumph Gold Corp., (TSX-V: TIG) (OTCMKTS: TIGCF) (“Triumph Gold” or the “Company”) is pleased to announce that its trading symbol on the OTCQB Venture Market has changed to TIGCF effective December 7, 2017. Vancouver, British Columbia: September 5, 2017. Triumph Gold Corp., (TSX-V: TIG) (OTCMKTS: NFRGF) (“Triumph Gold” or the “Company”) applauds the announcement made on September 2, 2017 by Prime Minister Justin Trudeau and Yukon Premier Sandy Silver committing more than $360 million in combined federal and territorial funding to improve road access in two mineral-rich areas in Yukon, including the Dawson Range in central Yukon. In total, the Yukon Resource Gateway Project will help upgrade over 650 kilometres of road and build or replace numerous bridges, culverts and stream crossings. In the Dawson Range, four separate public road systems will be upgraded. This includes upgrading the first 82 kilometres of the existing Freegold Road which provides access to Triumph Gold’s Freegold Mountain project. The Company’s Nucleus and Revenue deposits are accessed by secondary roads that extend less than two kilometres from the Freegold Road. All of the other important showings as well as the Tinta deposit are accessed by secondary roads that branch off the Freegold Road. Paul Reynolds, President and CEO of Triumph Gold stated, “This funding is a significant commitment from both the Territorial and Federal governments and reaffirms our belief that Yukon is one of the best jurisdictions in Canada for mining exploration”. Vancouver, British Columbia: June 7, 2017. Triumph Gold Corp., (TSX-V: TIG) (OTCMKTS: NFRGF) (the “Company”) has commenced a 13,000 metre diamond drill program at its road accessible Freegold Mountain project in the Dawson Range, Yukon. The program will test several new drill targets identified during 2016 field exploration and data review. The 2016 work focused on identifying geological controls on mineralization at the Revenue and Nucleus porphyry deposits on the Freegold Mountain Property. These studies recognized an early stage of porphyry-style mineralization that was not targeted during past exploration. The work defined three new exploration targets, one each at Revenue and Nucleus, and a newly identified porphyry target at the Generation Zone. Drilling is now underway at the Generation Zone, a newly recognized porphyry Cu-Au system. It is located approximately 800 metres north of the Revenue diatreme in an area with deep overburden. The Generation Zone is exposed in Revenue Creek as a result of historical placer mining activity and consists of multiple generations of dense stockwork veining including 2 mm to 5 cm quartz ± magnetite ± pyrite ± chalcopyrite ± bornite veins, early epidote veins, and a single 1.5 m thick quartz-pyrite-chalcopyrite vein. The veins have strongly sodic and potassic altered selvages. The Generation Zone is centered above a 2.9 X 1.3 km chargeability high (up to 64 milliradians) with a modeled depth approximately 150 m beneath surface. Nine historical samples collected from the Generation Zone assay between 60 and 2,980 parts per million (ppm) Cu and 5 to 212 parts per billion (ppb) Au, with an average grade of 706 ppm Cu and 38 ppb gold. The identification of high density stockwork with multiple vein events, high temperature alteration, and associated copper and gold mineralization indicates that the Generation Zone represents a high-temperature core to a porphyry Cu-Au system. Triumph plans 2,000 metres of drilling to test this zone. A second drill will be mobilized within a week and begin drilling at the Revenue and adjacent Blue Sky Zones. At Revenue, past exploration focused on the mineralized margin of an approximately 1 km long elliptical diatreme. The 2016 work program identified high-temperature potassic alteration and dense quartz-pyrite-chalcopyrite-molybdenite stockwork veining related to a hydrothermal system that predates emplacement of the diatreme. Historical drill holes RVD11-019, RVD11-022, and RVD11-028 were collared 165 m east of the diatreme and drilled away from, or parallel to, the diatreme, and each intersected broad intervals of mineralization related to the early hydrothermal system (e.g. RVD11-028 0.17% Cu, 0.29 grams/tonne (g/t) Au over 125.07 m [83.23 – 208.30 m]; RVD11-019 0.12% Cu, 0.18 g/t Au over 144.80 m [30.50 – 175.30 m); RVD11-022 0.13% Cu, 0.28 g/t Au over 243.60 m [61.10 – 304.70 m]). Mineralized intervals in drill holes RVD11-019 and RVD11-028 are contained within broader and higher grade sections where second stage mineralization, related to emplacement of a pyroclastic dyke, is superimposed on the earlier stage porphyry mineralization (e.g. RVD11-019 0.16% Cu, 0.66 g/t Au over 196.02 m [368.88 – 476.94 m]; RVD11-028 0.22% Cu, 0.47 g/t Au over 144.80 m [112.20 – 257.00 m]). The porphyry style mineralization encountered in these drill holes is open to the north, south and east; to the west it is overprinted by the Revenue diatreme. The newly recognized highly-prospective area, named the Blue-Sky Zone, covers over 2.3 km2 with coincident Cu and Mo soil anomalies and four notable chargeability anomalies. The Company plans 5,000 metres to test these areas. Drilling at the Revenue and Blue Sky Zones will constitute significant step outs, up to 1.5 km, from the current resource areas at Revenue. Other areas that will be drill tested include the Nucleus Zone (4,000m) and a soil and geophysical anomaly that extends 2 km along strike between the Nucleus and Revenue deposit areas (2,000 m). The Nucleus deposit involves several superimposed deposit types. Past exploration primarily focused on narrow high grade gold zones at the southern margin of a leucogranite intrusion. The 2016 field work identified the leucogranite as a causative intrusion for early stage porphyry-style gold and copper mineralization that is overprinted by later mineralization related to emplacement of quartz-feldspar-porphyry dykes. Most of the greater than 20 m long drill intersections at Nucleus, with good gold and copper mineralization, are located at the contact between the leucogranite and surrounding metamorphic country rock. Mineralization along this highly-prospective contact is open to the north along both the eastern and western margins of the intrusion. Some of the northernmost drill holes that test the contact have encouraging results including, GRD06-022, which intersected an average grade of 0.22% Cu and 0.72 ppm Au over 46.30 m, GRDN01-03 which intersected an average grade of 1.19 g/t Au over 87.47 m, and GRD08-096 which intersected an average grade of 0.13% Cu and 0.23 g/t Au over 39.55 m. Greater than 2.5 km’s of the leucogranite contact is untested by drilling and defines a new exploration opportunity at Nucleus. Vancouver, British Columbia: May 17, 2017. Triumph Gold Corp. (TSX-V: TIG) (OTCMKTS: NFRGF) (the “Company”) is pleased to announce plans for the upcoming 2017 field season. 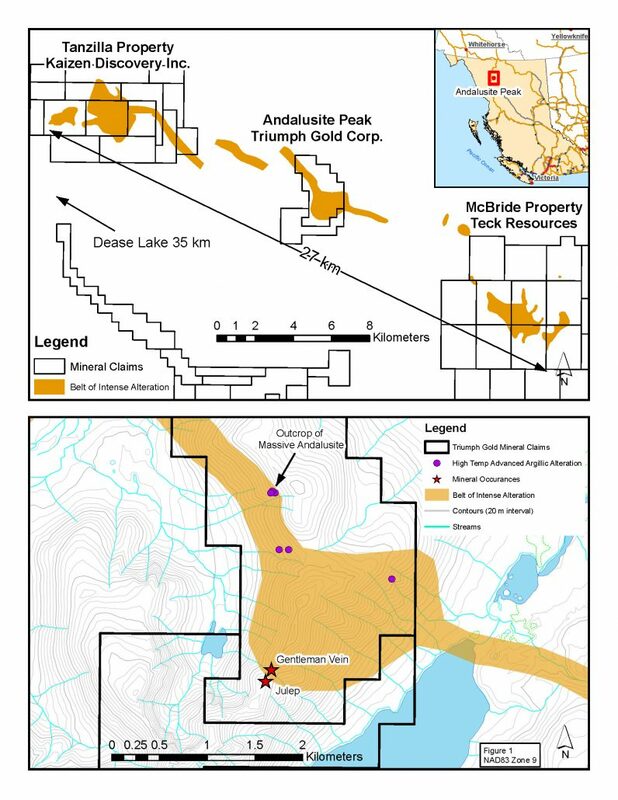 Triumph intends to execute a $4 million exploration program on the Freegold Mountain property, as well as smaller reconnaissance mapping and sampling projects on Tad/Toro and Severance properties in Yukon and Andalusite Peak in northern British Columbia. Revenue and the adjacent Blue Sky Zone (5,000 m). Revenue is a porphyry style deposit that contains 1.0 million Ozs gold, 8.98 million Ozs Ag, and 241 million lbs copper within 80.8 million tonnes in the inferred category (0.5 g/t AuEq1 cut-off). 2017 drilling near Revenue will focus on the Blue Sky Zone, a 2.3 square km area to the east of Revenue, with coincident soil and chargeability anomalies that are adjacent to and along strike of some of the longest and best drill intersection within the main Revenue Zone (e.g. 0.16% Cu, 0.66 g/t Au over 196.02 m [RVD11-019 368.88 – 476.94m]). Vancouver, British Columbia: March 22, 2017. Triumph Gold Corp. (formerly Northern Freegold Resources Ltd.) (TSX-V: TIG) (“Triumph” or the “Company”) is pleased to announce that it has retained IR Pro Communications Inc. (“IRPC”) of Delta, British Columbia to assist the Company with the expansion of its investor relations and corporate communications activities. IRPC is a well-established investor and public relations firm who’s knowledge and experience enables successful communication to the investment community creating and expanding awareness for its clients. IRPC’s focus is on emerging small and micro-cap companies providing targeted strategies for increasing their profiles in financial markets. More information on IRPC is available on their website at: www.irprocommunications.com. The principal of IRPC is Nancy Massicotte. Ms. Maccisotte and IPRC do not currently own any securities of the Company but will be eligible for future option grants. Subject to TSX Venture Exchange approval, Triumph has agreed to pay IRPC a monthly fee of C$3,500 plus GST. IRPC’s engagement with Triumph is for a one year term and may be terminated at any time on 30-days’ advance notice. Vancouver, British Columbia: March 17 2017. Triumph Gold Corp. (formerly Northern Freegold Resources Ltd.) (TSX-V: TIG) (“Triumph” or the “Company”) is pleased to announce that at the annual general meeting of the shareholders held on March 8, 2017, incumbent directors John Anderson, Paul Reynolds, Joe Campbell and Marco Strub were re-elected to the board of directors, and Gregory Sparks was elected as a new director. At the meeting, shareholders also approved all other matters to be voted on. The Company would like to thank previous directors Bill Harris and Greg Johnson who did not stand for re-election at the annual general meeting. The Company appreciates the efforts of both Greg and Bill and in particular would like acknowledge Bill’s efforts in consolidating the land package that is now Freegold Mountain. Not for distribution in the United States or to U.S. wire services. Vancouver, British Columbia: March 2 2017. Triumph Gold Corp. (formerly Northern Freegold Resources Ltd.) (TSX-V: TIG) (“Triumph” or the “Company”) is pleased to announce that it has completed a private placement financing of 11,880,000 flow through shares of Triumph (the “Offering”). The Offering was sold at a price of $0.528 per share for proceeds of $6,272,640. The private placement is part of a charity flow through arrangement through which Goldcorp Inc. (“Goldcorp”) was the end purchaser of the shares sold in the Offering. As a result of the private placement Goldcorp now owns approximately 19.9% of the Company’s issued and outstanding shares. The technical content of this news release has been reviewed and approved by Tony Barresi, Ph.D., P.Geo, Vice President Exploration of the company and a qualified person for the purposes of National Instrument 43-101 — Standards of Disclosure for Mineral Properties of the Canadian Securities Administrators. Vancouver, British Columbia: February 27, 2017. 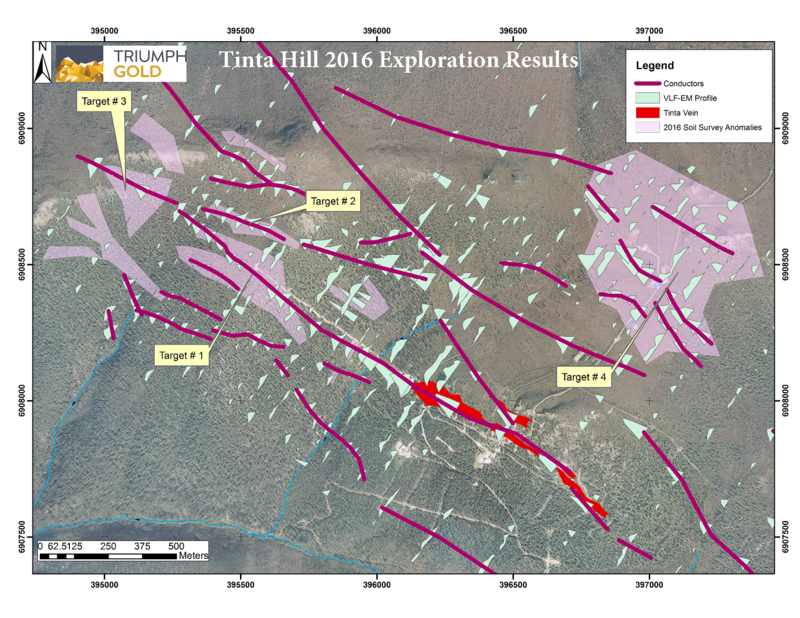 Triumph Gold Corp. (formerly Northern Freegold Resources Ltd.) (TSX-V: TIG) (the “Company”) is pleased to announce results of a 70 line-km ground magnetic and VLF-EM survey, and 10 line-km (414 sample) soil geochemical survey conducted in the vicinity of the Tinta Hill polymetallic vein deposit. The objective of the geophysical surveys was to characterize the geophysical signature of the Tinta Hill deposit and then to use that signature to identify prospective along-strike or (sub)parallel structures. The soil geochemical survey was intended to complement the geophysical survey and to expand the existing soil grid, which covers the immediate Tinta deposit area and extends along strike 1 km to the southeast. The Tinta deposit is part of a 4.6 km long northwest trending linear magnetic low and coincident prominent VLF-EM conductor. Target 1 is located 450 metres to the northwest and along strike of the Tinta deposit. It is part of the same continuous VLF-EM conductor as the deposit. The target has a 630 metre strike length and includes highly anomalous concentrations of Au, Ag and Pb in soils. The geochemical anomaly is centered on an approximately 90-metre-long portion of the conductor axis where conductivity is low in the center but is flanked by broad weak to moderate conductivity, similar to the VLF-EM signature where the Tinta vein is thickest. Target 2 is located approximately 150 metres north of the first target, where a second, oblique (280°) conductor is coincident with a Au, Ag, and Pb in soil geochemical anomaly over approximately 340 metres. Target 3 is located 1.15 kilometres northwest of the Tinta deposit. It is coextensive with the intersection of the conductors that define targets one and two. The intersection is coincident with a strong Au, Ag, Pb and Bi in soil anomaly that covers an area of three hectares along and downslope of the conductors. Target 4 is located 1.4 km to the north-northeast of the Tinta deposit, beyond the edge of current and historical soil geochemistry grids. This broad target area encompasses the intersections of at least three moderate to strong conductors. The 2017 exploration program at Tinta Hill will include prospecting and trenching within the target areas. Further geophysical and in-fill geochemical surveys will be conducted to the north and northwest of the 2016 survey area. Soil samples were collected at predetermined locations identified using a global positioning system. Samples were collected from B-horizon, or below the top layer of volcanic ash where B-horizon could not be sampled. The samples were characterized, dried, and delivered to ALS Minerals Preparation Laboratory in Whitehorse. Samples were analyzed using Au-ST43 (super trace Au determination via 25.0 g aqua regia digestion and ICP-MS analysis) and ME-MS41 (51 element analysis via 0.5 g aqua regia digestion and ICP-MS analysis). Very low frequency electromagnetic (VLF-EM) and total magnetic field (TMF) data were collected along a 70 line-km grid using a station spacing of 12.5 m and 200 m line spacing with 50 m spaced infill lines over part of the grid. GEM Systems’ GSM—19 magnetometer + VLF + GPS and GSM-19 base station magnetometer were used to collect the data. VLF-EM data were collected from three VLF stations: frequency 24.0 kHz – Cultler, frequency 24.8 kHz – Jim Creek, and frequency 25.2 kHz – La Moure. The base station magnetometer was installed in a magnetically quiet area and cycled at 3s during the survey. Raw data was imported into a LibreOffice Calc spreadsheet and diurnal corrections were applied. Quality control ratings were assigned to each reading and only data flagged as “good” were selected for subsequent gridding and profiling. The reported geophysical and geochemical program was carried out by TerraLogic Exploration Inc. under the supervision of Michael McCaig (P.Geo). The technical content of this news release has been reviewed and approved by Tony Barresi, Ph.D., P.Geo, Vice President Exploration of the company and qualified person for the purposes of National Instrument 43-101 — Standards of Disclosure for Mineral Properties of the Canadian Securities Administrators. Vancouver, British Columbia: January 25, 2017. Triumph Gold Corp. (formerly Northern Freegold Resources Ltd.) (TSX-V: TIG) (the “Company”) announces further to its January 24, 2017 news release, that due to a TSX Venture Exchange technical error the Company will trade under the symbol AUCU until the close of trading on January 26, 2017. The Company will commence trading under the correct symbol “TIG” at market opening on January 27, 2017. Vancouver, BC: January 23, 2017. Northern Freegold Resources Ltd. (TSX-V: NFR) (the “Issuer” or the “Company“) is pleased to announce the following management appointments. The Company is pleased to announce the appointment of Tony Barresi, Ph.D., P.Geo., as Vice President, Exploration of the Company. Dr. Barresi is an economic geologist with greater than ten years of base and precious metal exploration experience. He has conducted successful exploration programs on grassroots and brownfields projects, and specializes in volcanogenic massive sulfide, porphyry and epithermal deposit exploration. He also has experience conducting exploration for rare-earth-element, Mississippi-valley type, iron-oxide-copper-gold, skarn, orogenic gold, and diamond deposits. Tony obtained his B.Sc. (honours) from Saint Mary’s University in 2004 and Ph.D. from Dalhousie University in 2015. His Ph.D. thesis focused on the interplay between island-arc evolution and metallogenesis as recorded by the Hazelton Group in northwestern British Columbia, within one of Canada’s premiere metal districts. Tony was awarded the prestigious Mary-Claire Ward Geoscience Award for his thesis by the Prospectors and Developers Association of Canada (PDAC) and the Geological Association of Canada (GAC). The Company is pleased to report the appointment of Glen Diduck as interim Corporate Secretary. Mr. Diduck is currently the Company’s Chief Financial Officer. Glen has over 30 years of experience in public accounting with a focus on accounting, audit, and taxation of small to medium sized businesses. Since leaving the public accounting sector his focus has shifted to required disclosure in financial reporting, disclosure controls, and corporate governance in the junior mining exploration industry. Mr. Diduck replaces Connie Norman. The Company wishes to thank Connie for her years of service to the Company. Vancouver, British Columbia: January 24, 2017. Northern Freegold Resources Ltd. (TSX-V: NFR) (the “Company”) is pleased to announce that it has received TSX Venture Exchange acceptance to proceed with the change of its name to “Triumph Gold Corp”. Effective at market opening on Wednesday, January 25, 2017, the Company’s common shares will commence trading under its new name and ticker symbol “TIG” on the TSX Venture Exchange stock market. Vancouver, BC: November 21, 2016. Northern Freegold Resources Ltd. (TSX-V: NFR) (the “Issuer” or the “Company“) is pleased to announce that it has closed the private placement previously announced on November 7, 2016. Due to increased demand, a total of 7,105,000 Units were issued for gross proceeds of $1,776,250. Each Unit is comprised of one common share of the Issuer and one share purchase warrant of the Issuer. Each Warrant is exercisable into an additional common share at a price of $0.35 per share for a period of 4 years from the date of closing. Finders’ fees of $51,000 are payable in connection with the private placement. All securities issued in connection with the Offering will be subject to a four-month hold period commencing on the Closing Date, in accordance with applicable Canadian securities laws. Net proceeds of the private placements will be used for general working capital purposes and to advance the company’s mineral properties. The Offering remains subject to acceptance by the TSX Venture Exchange. Vancouver, BC: November 7, 2016. Northern Freegold Resources Ltd. (TSX-V: NFR) (the “Issuer” or the “Company“) is pleased to announce that it will be undertaking a financing of up to 7 million units (the “Units”) at $0.25 per Unit for gross proceeds of up to $1,750,000 (the “Offering”). Each Unit is comprised of one common share of the Issuer (the “Unit Share”) and one share purchase warrant of the Issuer (a “Warrant”). Each Warrant is exercisable into an additional common share at a price of $0.35 per share (a “Warrant Share”) for a period of 4 years from the date of closing (the “Closing Date”). The Company further announces that it has closed on 6,340,500 Units today for gross proceeds of $1,585,125. Finders’ fees of $28,700 are payable in connection with the First Tranche closing. All securities issued in connection with the Offering will be subject to a four-month hold period commencing on the Closing Date, in accordance with applicable Canadian securities laws. Net proceeds of the private placements will be used for general working capital purposes and to advance the company’s mineral properties. Finder’s fees may be payable on a portion of the balance of the financing. The Offering is subject to acceptance by the TSX Venture Exchange. Vancouver, BC – September 27, 2016 – Northern Freegold Resources Ltd. (TSX-V: NFR) www.northernfreegold.com announces that the 2016 exploration program at Freegold Mountain, Yukon has been successfully completed. Northern Freegold has completed a 70-line km magnetic and VLF-EM geophysical survey as well as a 10-line km (approx.) of multi-element geochemical soil survey at the Tinta Hill deposit. Geophysical data is being interpreted by the Company’s geophysical consultants and soil samples have been delivered to the lab for analysis. Results will be released once they are received and interpreted by the Company. The Tinta Hill Deposit is a structurally controlled, polymetallic low to intermediate sulphidation epithermal system. The main Tinta vein hosted deposit has been the dominant target for exploration since its discovery in 1930. There are also three other known veins in the immediate area that remain underexplored and warrant follow up work. The 2016 field program will provide additional geophysical and geochemical coverage outside of the main deposit with the objective of defining trench and/or diamond drill targets. The Tinta Hill exploration program is being funded in part by a Yukon Mineral Exploration Program (YMEP) grant. Exploration crews spent roughly three weeks in the field conducting geological mapping and re-logging select drill core. While the field portion of this work is complete, lab work is ongoing. Results from this work will be reported later this fall when completed. The primary objective of this work is to define a paragenetic sequence to better target the porphyry style mineralization. This information will be utilized to guide future drill programs which will target higher-grade mineralized zones. The Freegold Mountain project is located within the Dawson Range and covers an area in excess of 198 square km (75 square miles). The project has significant infrastructure advantages and is located only 200 km northwest of Whitehorse, the capital and industrial center of Yukon. It is road accessible from Whitehorse, along the main paved all-weather Klondike Highway, then along the 70 km government maintained Freegold Road from Carmacks. This road currently terminates near the Company’s Revenue camp, providing road access to the Nucleus, Revenue and Tinta deposits as well as most of the mineralized showings on the property. Commercial electrical grid power (138kv) is available at Carmacks and Stewart Crossing with a spur electrical line extending into the Minto copper mine 30 km north of the Freegold Mountain project. The Freegold Mountain property covers a fertile and very prospective segment of the Big Creek Fault Zone and is endowed with three significant mineral deposits and numerous showings, which represent porphyry-epithermal systems related to Mid- and Late-Cretaceous magmatic events. The Late-Cretaceous event, defined by Allan et al. 2013 and Bineli, 2011, has been recognized on the Freegold Mountain property to span at least 5 Ma (79 Ma — 74 Ma). This event is responsible for the emplacement of the Stoddart (porphyry) prospect and both the Revenue (porphyry) and Nucleus (porphyry-skarn-epithermal) deposits, as well as numerous other showings including the recently discovered Irene (epithermal) prospect. These porphyry-hydrothermal systems define an 8.0 km northwest trending fertile exploration corridor within the Big Creek Fault Zone. This work was supported by a contribution from the Yukon Mineral Exploration Program (YMEP). Paul Reynolds, B. Sc., P. Geo., President of Northern Freegold Resources Ltd., is the Qualified Person, as defined by NI 43-101, for the Freegold Mountain Project and has reviewed and approved the technical information in this release. Northern Freegold announces that it has dropped the option on the Burro Creek property to better focus its efforts on the Freegold Mountain project. Vancouver, BC – July 7, 2016 – Northern Freegold Resources Ltd. (TSX-V: NFR) www.northernfreegold.com crews have been mobilized to the Yukon to begin phase one of the company’s 2016 exploration program. Initially, the company will focus on the controls of mineralization at Nucleus and Revenue in order to vector in on higher grade mineralized zones adjacent to, and within the known mineral deposits. An important goal of this work will be to define a paragenetic sequence to better target the porphyry style mineralization. This information will be utilized to guide future drill programs, which will target higher-grade mineralized zones. 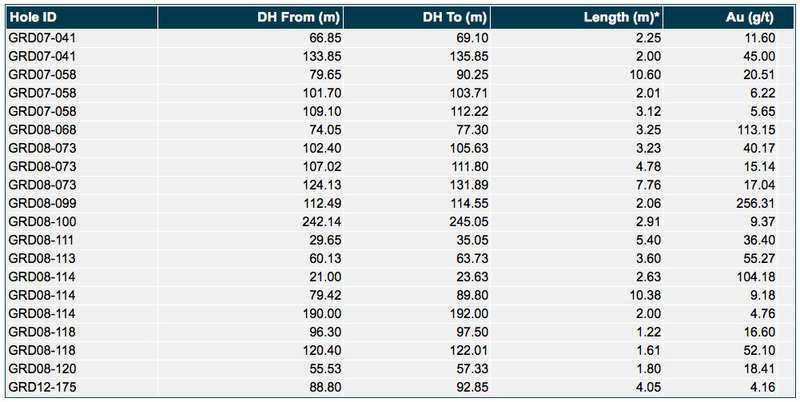 Previous diamond drilling at Nucleus has returned a number of holes with high grade gold results from a 500 metre by 200 metre gold rich core that remains open (partial listing of selected drill results below). Concurrently with this program, the Northern Freegold plans to complete a 70-line km magnetic and VLF-EM geophysical survey at the Tinta Hill deposit as well as a 10-line km multi-element geochemical soil survey. The Tinta Hill Deposit is a structurally controlled, polymetallic low to intermediate sulphidation epithermal system. The main Tinta vein hosted deposit has been the dominant target for exploration since its discovery in 1930; however there are three other known veins in the immediate area that remain underexplored and warrant follow up work as well. The proposed field program will provide additional geophysical and geochemical coverage over the three veins outside of the main deposit with an objective of defining trench and/or diamond drill targets. The Freegold Mountain project is located within the Dawson Range and covers an area in excess of 198 square km (75 square miles). The project has significant infrastructure advantages. It is located approximately 200 km northwest of Yukon’s capital and industrial center in Whitehorse. It is road accessible from Whitehorse, along the main Klondike Highway, a paved all-weather highway, thence along a 70 km government maintained road from Carmacks, called the Freegold Road. This road currently terminates near the Company’s Revenue camp and provides road access to the Nucleus, Revenue and Tinta deposits as well as most mineralized showings on the property. Commercial electrical grid power (138kv) is available at Carmacks or Stewart Crossing. A spur electrical line extends into the Minto copper mine 30 km north of the Freegold Mountain project. The Freegold Mountain property covers a fertile and very prospective segment of the Big Creek Fault Zone and is endowed with three significant mineral deposits and numerous showings, which represent porphyry-epithermal systems related to Mid-and Late-Cretaceous magmatic events. The Late-Cretaceous event, defined by Allan et al. 2013 and Bineli, 2011, has been recognized on the Freegold Mountain property to span at least 5 Ma (79 Ma — 74 Ma) and is responsible for the emplacement of the Stoddart (porphyry) prospect and both the Revenue (porphyry) and Nucleus (porphyry-skarn-epithermal) deposits as well as numerous other showings including the recently discovered Irene (epithermal) prospect. These porphyry-hydrothermal systems define an 8.0 km northwest trending fertile exploration corridor within the Big Creek Fault Zone. Recently Northern Freegold has been focused on select areas to the east of Nucleus and Revenue, which showed the potential for higher-grade gold mineralization. This initial work culminated in the discovery of the Irene zone where bedrock sampling in 2013 and 2014 returned 7.11 g/t Au over 3.0 metres in TR13-021 (see news release #14-03 dated February 27, 2014) and 9.45 g/t Au, 114.5 g/t Ag, 0.79% Cu over 1.00 metre in trench TR14-037 (see news release #14-11 dated November 17, 2014) highlighting the potential for high-grade gold+/-silver+/-copper mineralization at surface, in an under-explored area of the property. Vancouver, BC – April 5, 2016 – Northern Freegold Resources Ltd. (TSX-V: NFR) www.northernfreegold.com is pleased to announce that it has closed the previously announced private placement. A total of 10,050,734 units (the “Units”) at a price of $0.06 per Unit for gross proceeds of $603,044.04 (the “Offering”). Each Unit is comprised of one common share of the Issuer (the “Unit Share”) and one half of one transferable common share purchase warrant of the Issuer (each whole warrant, a “Warrant”). Each Warrant is exercisable into an additional common share at a price of $0.10 per share (a “Warrant Share”) for a period of 3 years from the date of closing (the “Closing Date”). After six months from the Closing Date, should the daily volume weighted average trading price of the common shares of the Company exceed $0.25 for ten consecutive trading days, the Company may, within 30 days of such an occurrence, give notice to the warrantholders that it is accelerating the expiry date of the Warrants such that the Warrants will expire following the 30th day from the date of the notice unless exercised prior to such date. All securities issued in connection with the Offering will be subject to a four month hold period expiring on August 6, 2016, in accordance with applicable Canadian securities laws. Net proceeds of the private placements will be used for general working capital purposes and to advance the Company’s mineral properties. The Offering remains subject to final acceptance by the TSX Venture Exchange. Vancouver, BC – April 4, 2016 – Northern Freegold Resources Ltd. (TSX-V: NFR) www.northernfreegold.com (the “Issuer” or the “Company”) is pleased to announce a private placement of up to 11,666,666 units (the “Units”) at $0.06 per Unit for gross proceeds of up to $700,000 (the”Offering”). Each Unit is comprised of one common share of the Issuer (the “Unit Share”) and one half of one transferable common share purchase warrant of the Issuer (each whole warrant, a “Warrant”). Each Warrant is exercisable into an additional common share at a price of $0.10 per share (a “Warrant Share”) for a period of 3 years from the date of closing (the “Closing Date”). After six months from the Closing Date, should the daily volume weighted average trading price of the common shares of the Company exceed $0.25 for ten consecutive trading days, the Company may, within 30 days of such an occurrence, give notice to the warrant holders that it is accelerating the expiry date of the Warrants such that the Warrants will expire following the date of the notice unless exercised prior to such date. All securities issued in connection with the Offering will be subject to a four month hold period commencing on the Closing Date, in accordance with applicable Canadian securities laws. Net proceeds of the private placements will be used for general working capital purposes and to advance the company’s mineral properties. The Offering is subject to acceptance by the TSX Venture Exchange. Vancouver, BC – May 1, 2016 – Northern Freegold Resources Ltd. (TSX-V: NFR) www.northernfreegold.com is pleased announce that it has retained the services of Renmark Financial Communications Inc., to handle its investor relations activities. “We are pleased to announce that we have selected Renmark to reinforce Northern Freegold’s profile in the financial community and enhance the visibility of our project portfolio. We chose Renmark because its standards and methodologies fit best with the message we wish to communicate to the investing public,” noted John Anderson, Chairman of Northern Freegold Resources Ltd. In consideration of the services to be provided, the Company has agreed to pay a monthly retainer of $4,000 starting May 1st, 2015 to Renmark Financial Communications Inc.
Renmark Financial Communications does not have any interest, directly or indirectly, in Northern Freegold Resources Ltd., or its securities, or any right or intent to acquire such an interest. Vancouver, BC – March 25, 2015 – Northern Freegold Resources Ltd. (TSX-V: NFR) www.northernfreegold.com announces that the Company has filed on SEDAR an updated technical report titled “Technical Report on the Freegold Mountain Project, Yukon, Canada, Resource Estimates, February 28, 2015”“(the “Updated Report”). The Updated Report is filed in support of resource estimates at the Nucleus, Revenue and Tinta deposits at the Company’s 100% owned Freegold Mountain Project, Yukon. * Gold equivalent (AuEq) is calculated based upon prices of US$1250/oz for gold, US$22.00/oz for silver, US$2.90/lb for copper, and US$10.00/lb for molybdenum and assumes 100% metal recovery. All figures are rounded to reflect the relative accuracy of the estimate and numbers may not add up due to rounding. ** Mineral resources do not demonstrate economic viability, and there is no certainty that these mineral resources will be converted into mineable reserves once economic considerations are applied. The updated resource (at a 0.30 g/t AuEq cut-off) contains 74.7 million tonnes grading 0.55 g/t gold, 0.91 g/t silver and 0.06% copper (1.31 million oz gold, 2.18 million oz silver and 105 million pounds copper) in the Indicated category (Table 1) and 63.8 million tonnes grading 0.39 g/t gold, 1.54 g/t silver and 0.05% copper (0.80 million oz gold, 3.15 million oz silver and 69 million pounds copper) in the Inferred category (Table 2). Importantly, within the indicated resource there is a significant zone of higher grade mineralization which contains (at a 0.60 g/t AuEq cut-off) 23.4 million tonnes grading 1.07 g/t gold, 1.20 g/t silver and 0.08% copper (0.80 million oz gold, 0.90 million oz silver and 41 million pounds copper). This higher grade zone subcrops in the centre of the Nucleus deposit and has the potential to be exploited in the initial years of a mining operation. The effective date of the Nucleus resource estimate is December 15, 2014. *Gold equivalent (AuEq) is calculated based upon prices of US$1250/oz for gold, US$22.00/oz for silver, US$2.90/lb for copper, and US$10.00/lb for molybdenum and assumes 100% metal recovery. All figures are rounded to reflect the relative accuracy of the estimate and numbers may not add up due to rounding. The resource estimate is based on more than 31,000 assay values from 322 drill holes (totaling > 50,000 metres). Assay values were verified against drill logs and assay certificates. Drill hole collar locations and down-hole surveys were checked and verified. The mineral resource was estimated using 1.50 metre composites of the assay values, with “zero” grade inserted into intervals that were not sampled. Geological models were constructed of the porphyry dykes that control the higher grade mineralization, and shells were constructed of >0.4 g/t AuEq core mineralization and a >0.1 g/t AuEq halo surrounding the core. Composite samples were domained by utilizing the geological and the grade shell models. Composite values were capped at 100 g/t Au within the core mineralization models (>0.4 g/t AuEq and the associated porphyry), and at 30 g/t Au within the halo mineralization models (>0.1 g/t AuEq and the associated porphyry) and the waste model. No capping was applied to silver or copper. The geological models were used to constrain the composite values chosen for interpolation and the blocks reported in the mineral resource. A block model was constructed using 10 m x 10 m x 5 m blocks in the x, y, and z direction respectively. Grades for gold, copper and silver were interpolated into the blocks by the inverse distance squared method using a minimum of 2 and maximum of 12 composites to generate block grades in the indicated category and a minimum of 1 and maximum of 5 composites, with a maximum of 2 composites per drill hole, to generate block grades in the inferred category. The above parameters were deemed the best for generating representative resource blocks. To test the robustness of the parameters changes were made to interpolation methods (ID, ID3, Ordinary Kriging) and to search dimensions and orientations. These changes resulted in minimal impact on global resource estimates. The Nucleus deposit mineralization begins at surface and is open to expansion laterally and at depth. The existing resource estimate tests only the upper reaches of a high chargeability and high conductivity zone identified by a Titan 24 survey completed in 2010. This zone extends over an area 1.5 km wide by 1.5 km long at an approximate depth of 100 to 500 m below surface. The Nucleus deposit is classified as an intrusive related low sulphidation epithermal gold deposit and may be part of a much larger porphyry Cu ± Au ± Mo system recognized in the Revenue Zone. An Inferred Mineral Resource for the Revenue deposit is reported at a cut-off grade of 0.5g/t AuEq. The total resource estimate at a AuEq cut-off grade of 0.50g/t is 80.8 million tonnes of mineralized material containing 1.01 million ounces gold, 8.96 million ounces silver, 241 million pounds of copper, and 83 million pounds of molybdenum grading 0.39g/t gold, 3.45g/t silver, 0.14% copper and 0.05% molybdenum (Table 3). This equates to a total of 2.52 million gold equivalent ounces at a grade of 0.92 g/t AuEq based on metal prices of $1,250/oz for gold, US$22.00/oz for silver, and US$2.90/lb for copper and US$10.00/lb for molybdenum. It assumes 100% metal recovery with no discount for metallurgical recovery in contained metal figures. The Revenue zone contains significant tungsten values (Armitage et al, 2012). However, due to the uncertainty of the potential metal recoveries, tungsten is not reported as part of the Revenue resource. The effective date of the Revenue resource estimate is December 15, 2014. A total of 240 RAB, RC and diamond drill holes totalling 27,244 metres have been completed in the Revenue area through 2011. The Revenue mineral resource estimate is defined by 54 of these drill holes (10,582 meters) completed in the eastern portion of the Revenue property area. A total of 5,997 assay values were collected from these 54 holes. For the resource estimate, a grade control model was built which involved visually interpreting mineralized zones on 50 metre cross sections using histograms of gold, copper, molybdenum and gold equivalent (“AuEq”) values. Polygons of mineral intersections were made on each cross section and these were wireframed together to create a contiguous resource model in Gemcom GEMS 6.3 software. This modeling exercise provided broad controls of the dominant mineralizing direction. The Revenue Zone is centred on an Upper Cretaceous age, east- west elongated tonalite porphyry stock, the Revenue Breccia that intrudes Mesozoic granitoids (predominantly granodiorite) of the Dawson Range Batholith. Intrusion of the tonalite stock into granodiorite caused brecciation of both the intrusive and the surrounding granodiorite along the northern, southern and eastern contact of the stock. Brecciation is best developed in the south-eastern end of the stock where the breccia can be several hundred metres wide in plan view. To the west, and along the north contact, the breccias narrow gradually to less than 100 metres. The overall dimension of the Revenue Breccia complex is approximately 1.4 by 0.6 kilometres. Primary copper, gold, molybdenum, silver and lesser tungsten mineralization was deposited from hydrothermal fluids that exploited the breccias and fractured wall rocks. Better grades occur in the southern and southwestern parts of the Revenue Breccia and granodiorite. A general zoning of the primary sulphides occurs with chalcopyrite, molybdenite ± tungsten and associated gold and silver grading outward into pyrite with associated low grade gold. Mineralization is associated with pervasive silicification and sericitization grading outwards into clay alteration marked by kaolinite and illite. Mineralization and alteration appear to be controlled by two sets of structures, one set trending west to northwest and the lesser set trending northwest to north. The Revenue Zone is classified as a porphyry Au-Cu-Mo-Ag system and may be part of a much larger system which includes the Nucleus Au-Ag -Cu Zone. The Revenue Zone shows similar geological and mineralogical characteristics to the Casino Cu-Au-Mo-Ag porphyry deposit, located approximately 100 km to the northwest. The Casino deposit contains a NI 43-101 compliant proven and probable mill ore reserve of 965 million tonnes grading 0.204 % Cu, 0.240 g/t Au, 0.0227 % Mo and 1.74 g/t Ag (Western Copper and Gold Corporation news release dated January 7, 2013). The Revenue resource model is a grade model which outlines the variable distribution of gold, copper, molybdenum, silver and tungsten along the southern and south-eastern margin of the Revenue Breccia and into the host granodiorite. The model is roughly based on a minimum AuEq grade of 0.1 to 0.2 g/t. The model trends at 275° and dips approximately 85° to the south. In the central part of the deposit area, mineralization extends northward at depth and may be defining the base of the breccia complex. The resource model essentially forms a band around the periphery of the Revenue breccia. A block model was created for the Revenue resource estimate using 10 x 10 x 5 metre blocks in the X, Y, and Z directions, respectively. The primary aim of the interpolation was to fill all the blocks within the resource models with grade. To generate grade within the blocks inverse distance squared (ID2) was used. Grades for gold, copper, silver, molybdenum and tungsten were interpolated into the blocks by ID2 using a minimum of 2 and maximum of 20 composites to generate block grades in the Inferred category. A visual check of block grades of gold, copper, silver, molybdenum and tungsten as well as AuEq against the composite data on vertical section and in 3D showed excellent correlation between block grades and drill intersections. The Revenue resource model is considered valid. The Revenue deposit mineralization is open to expansion laterally and at depth. Using a base case cutoff grade of 0.5 g/t Au, the Tinta zone is estimated to contain an Inferred Mineral Resource of 2.16 million tonnes grading 1.89 g/t Au for a total of 131,000 ounces, 54.9 g/t Ag for a total of 3.81 million oz,, 0.27% Cu for a total of 13 million Lbs, 0.99% Pb for a total of 47 million Lbs and 1.41% Zn for a total of 67 million Lbs (Table 4). A cut-off grade of 0.50 g/t Au is considered a reasonable economic cut-off grade for the Tinta zone to maximize the grade of the resource while maintaining a coherent model of the resource. The effective date of the Tinta resource estimate is December 15, 2014. **The Tinta resource estimate is categorized as Inferred as defined by the CIM guidelines for resource reporting. Mineral resources do not demonstrate economic viability, and there is no certainty that these mineral resources will be converted into mineable reserves once economic considerations are applied. Mineralization in the Tinta Hill property is dominated by northwest‐trending, sub‐vertical quartz +/‐ carbonate‐sulphide veins containing pyrite, chalcopyrite, galena, sphalerite and argentiferous tetrahedrite. The main Tinta vein zone is mapped discontinuously for over 3,500 metres strike‐length. Individual veins vary from 0.9 to 1.6m, and have intensely bleached alteration envelopes. Alteration consists of magnetite destructive, intense kaolinite adjacent to, and extending a few metres from mineralized veins, and a broader white mica (muscovite and lesser illite) envelope that locally surrounds mineralized veins. Mineralized veins and associated alteration envelope are hosted within granodiorite to quartz‐monzonite. The assay database used to construct the Tinta vein resource file included samples from diamond drill holes and underground development. The complete Tinta Hill drill hole database included 72 drill holes for a total of 9,824m and 1,940 assay samples. Of the 72 drill holes, 61 drill holes for a total of 8,637 m and 1,950 assays were used in the preparation of the resource model and resource estimate. A total of 939 metres of underground development was completed in the Tinta Hill property between 1980 to 1981 by Silver Tusk Mines Ltd and Panther Mines Ltd, including 516 metres of drifting and crosscutting in Level 1 (3,900 ft elevation) and 423 metres in Level 2 (3,750 ft elevation). Approximately 578 chip samples were used in the preparation of the resource model and resource estimate. For the Tinta vein resource estimate, grade control models were built which involved visually interpreting the mineralized zone from 25 metre spaced cross sections using histograms of silver, gold, copper, lead and zinc values. Polygons of mineral intersections were made on each cross section and these were wireframed together to create a contiguous resource model in Gemcom GEMS 6.6.0.1 software. The model was constructed based on the distribution of gold mineralization in the 0.1 to 0.5 g/t Au range and Ag in the 10 to 20 g/t range. The Tinta resource model includes the main Tinta vein and two sub-parallel subsidiary veins Vein B and Vein C. The modeling exercise provided broad controls of the dominant mineralizing direction. The Tinta resource model extends for approximately 950 metres trending 305°, and from surface to a depth of up to 350 metres. Based on a statistical analysis of the composite database from the resource model, it was decided that limited capping was required on the composite populations to limit high gold values. A cap level of 30 g/t Au was used. Grade capping of other metals was deemed unnecessary. A block model was created for the Tinta mineralized zone using 2 x 5 x 5 metre blocks in the X, Y and Z directions respectively. Grades for Au, Ag, Cu, Pb and Zn were interpolated into the Tinta resource blocks by the inverse distance squared (ID2) method. Visual checks of block grades against the composite data used to interpolate grade was conducted in plan view, in 3D and on vertical sections. The resource model showed good correlation between block grades and drill intersections. A statistical comparison of block grades with composite grades was also conducted. The Tinta resource model is considered valid. The Tinta deposit mineralization is open to expansion laterally and at depth. The Freegold Mountain project is located within the Dawson Range and covers an area in excess of 198 square kilometres (75 square miles). The project has significant infrastructure advantages. It is located approximately 200 kilometres northwest of Yukon’s capital and industrial center in Whitehorse. It is road accessible from Whitehorse, along the main Klondike Highway, a paved all-weather highway running from Whitehorse to Dawson City thence along a 70 kilometre government maintained road from Carmacks, called the Freegold Road. This road currently terminates near the Company’s Revenue camp and provides road access to the Nucleus, Revenue and Tinta deposits as well as most mineralized showings on the property. Commercial electrical grid power (138kv) is available at Carmacks or Stewart Crossing. A spur electrical line extends into the Minto copper mine 30 kilometres north of the Freegold Mountain project. The Freegold Mountain property covers a fertile and very prospective segment of the Big Creek Fault Zone and is endowed with three significant NI43-101 compliant mineral deposits and numerous showings which represent porphyry-epithermal systems related to Mid-and Late-Cretaceous magmatic events. The Late-Cretaceous event, defined by Allan et al. 2013 and Bineli, 2011, has been recognized on the Freegold Mountain property to span at least 5 Ma (79 Ma — 74 Ma) and is responsible for the emplacement of the Stoddart (porphyry) prospect and both the Revenue (porphyry) and Nucleus (porphyry-skarn-epithermal) deposits as well as numerous other showings including the recently discovered Irene (epithermal) prospect. These porphyry-hydrothermal systems define a 6.0 km northwest trending fertile exploration corridor within the Big Creek Fault Zone. The above mineral resource estimates have been prepared in compliance with the standards of NI 43-101 by J. Campbell, B.Sc., P. Geo., A. Armitage, Ph.D., P. Geol., A. Sexton, M.Sc., P. Geo., and D. Studd, M.Sc., P. Geo. of GeoVector Management Inc. Allan Armitage, Ph.D., P. Geol., is an independent Qualified Person, as defined by NI 43-101, and has reviewed and approved the scientific and technical disclosure in this release. Following a technical disclosure review by the British Columbia Securities Commission, on December 17, 2014 the Company announced that the previously filed technical report entitled “Golden Revenue Property, Freegold Mountain Project, Yukon Canada, Preliminary Economic Assessment, April 9, 2013” (the “PEA report”) did not comply with certain requirements of NI 43-101. The Company has determined to retract the PEA report rather than incurring the expense of obtaining an updated and amended PEA report. Investors are cautioned not to rely on the PEA report. The Updated Report referred to above is the most current technical report on the property. The information in this press release includes certain “forward-looking statements”. All statements, other than statements of historical fact, included herein are forward looking. Statements concerning Mineral Resources are forward-looking statements in that they reflect an assessment, based on certain assumptions, of the mineralization that would be encountered if the project were developed and mined in the manner described. Forward-looking statements involve various risks and uncertainties. There can be no assurance that such statements will prove to be accurate, and actual results and future events could differ materially from those anticipated in such statements. Important factors that could cause actual results to differ materially from the Company’s expectations include the uncertainties involving the need for additional financing to explore and develop properties and availability of financing in the debt and capital markets; uncertainties involved in the interpretation of drilling results and geological testing and the estimation of reserves and resources; the need for cooperation of government agencies and First Nations groups in the exploration, and development of properties; and the need to obtain permits and governmental approval. The Company’s forward looking statements reflect the beliefs, opinions and projections of management on the date the statements are made. The Company assumes no obligation to update the forward looking statements if management’s beliefs, opinions, projections, or other factors should change.